In the Harry Potter books, Molly Weasley carries the clock around at one point, so I concluded it probably wasn't a grandfather clock but something more like a mantle clock. 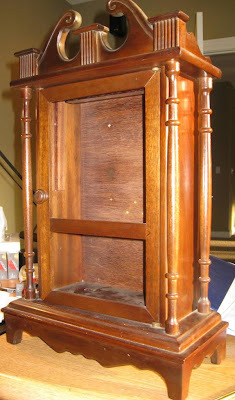 For the cabinet, I was able to buy an old clock body that met my needs. I found this one at a clock shop in the Mennonite country near Versailles, Mo. The proprietor ran an awesome shop chocked full of antique cuckoo clocks, mantle clocks and pocket watches. With a little tender loving care and some refinishing this shell has been transformed into the perfect vehicle for the Magic Clock. The great part is that with a little foot work and ingenuity, each clock becomes a one-of-a-kind masterpiece.